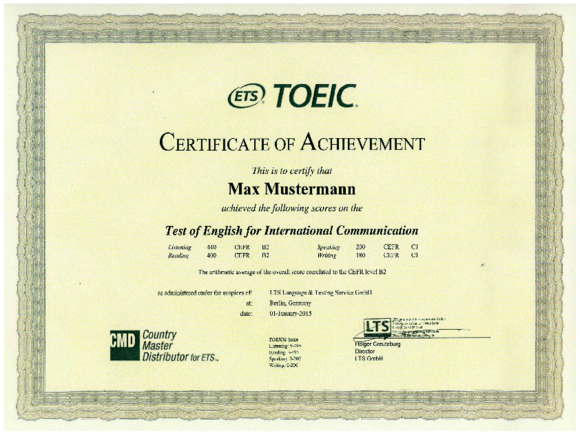 The Test Of English for International Communication, TOEIC®, is a standardized, objective test of Business English. With more than 7 million test candidates annually, it is the most used test worldwide. TOEIC® test results can be compared exactly across the world, thus ensuring high international recognition in companies, universities and business schools. Internationally successful companies use the TOEIC® Tests year after year in order to recruit and promote the most suitable candidates. Academic institutions also use the TOEIC® Tests as entrance criteria for applicants or as a final examination to improve the career opportunities of their graduates by enabling them to add a TOEIC® certificate to their application documents. The TOEIC® 4 Skills Test evaluates reading, listening, writing and speaking abilities thus providing reliable proof of all four language skills.